The Chairman of the Board of the KIN Consulting & Research Services, has decided to publish some of his solutions for the Global Warming Issues. His solution is simply to turn the world green. We must follow up an initiative started up by The Kingdom of Saudi Arabia, that involves turning salt water into drinking water. The Chairman is promoting these ideas in an effort to enhance competition in the production of the latest technology called, "Reverse Osmosis". A. Invest in more desalination companies and techniques (Reverse Osmosis Technique). B. Invest in the desert lands of Mexico, Tijuana, North Africa, Mid East, Australia, New Mexico, Nevada, Arizona, China, etc. C. Agricultural sales for Import and Export. A. Everybody who owns land at the beach. B. Everybody who thinks its too hot! C. Everybody who lives in a desert region and wants to turn it green. D. World Bank and other financial institutions. IV. What seeds to plant? A. Fruits and vegetables that can be sold to friendly markets. V. How do the investors recoup there investment? B. They sell the fruits and vegetables to pay back the loan. A. An increase in Fruits and Vegetables coming to market, should bring about a deflationary impact on the economy. Thus reversing any inflationary costs that arose due to fuel costs. The Environmental Impact would naturally be a cooling effect. As the deserts turn green, the carbon-dioxide will turn into Oxygen. End famine in the Third World by saving the planet with food, water, and clean air. Reverse Osmosis (RO)separation technology is used to remove dissolved impurities from water through the use of a semi-permeable membrane. RO involves the reversal of flow through a membrane from a high salinity, or concentrated, solution to the high purity, or "permeate", stream on the opposite side of the membrane. Pressure is used as the driving force for the separation. The applied pressure (P) must be in excess of the osmotic pressure of the dissolved contaminants to allow flow across the membrane. I strongly encourage you to search Google for the literally hundreds of companies in this industry. If you need the configuration for the hardware or software please contact Chairman Natto for further information. "Chairman Natto believes the World is panicking over the ramifications of Global Warming. 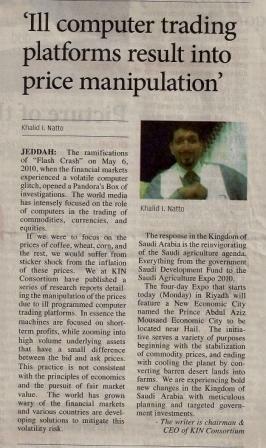 He has decided to promote a technology that was originally financed and created by The Kingdom of Saudi Arabia. The concept of converting seawater to potable water is the solution to reclaiming our planet. It solves a variety of concerns like famine & global warming. Join us in being proactive lets turn the world green."